Line bottom and sides of 13x9-inch (3-quart) glass baking dish with foil, leaving foil hanging over 2 opposite sides of pan. Spray foil with cooking spray. In food processor bowl with metal blade, place cookies. Cover; process until cookies are finely chopped. In 2-quart saucepan, cook marshmallows and butter over low heat, stirring constantly, until melted. Stir in chopped cookies and 3/4 cup of the chocolate chips until well mixed. Press in bottom of baking dish. In medium microwavable bowl, microwave milk and peanut butter chips uncovered on High 30 seconds. Stir; microwave 30 to 60 seconds longer, stirring every 30 seconds, until smooth and creamy. Stir in peanut butter until smooth. Stir in peanuts and crushed granola bars. Spread over chocolate layer. If peanut butter mixture starts to set, microwave uncovered on High 15 to 30 seconds or until warm and spreadable. In small microwavable bowl, microwave remaining 1/4 cup chocolate chips and the oil uncovered on High 30 to 45 seconds or until chips are melted and can be stirred smooth. 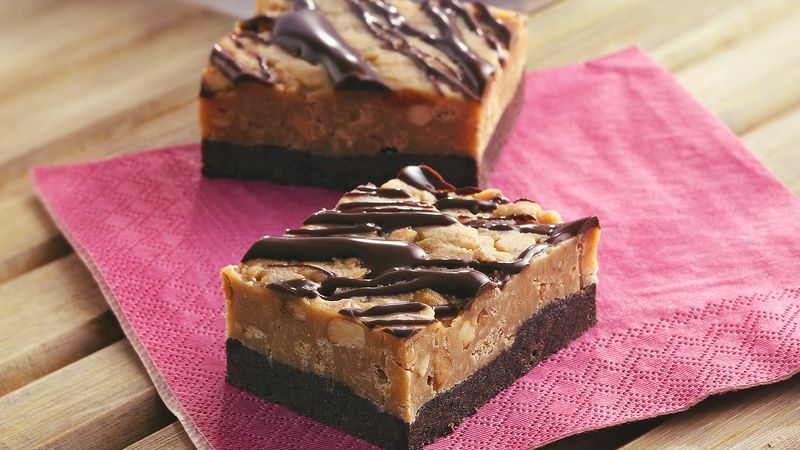 Drizzle chocolate diagonally over peanut butter layer. Refrigerate 30 minutes or until set. To cut bars, remove from pan, using foil to lift. Cut into 8 rows by 4 rows. Store covered in cool place. Your favorite cocktail peanuts or dry-roasted peanuts can be substituted for the honey-roasted peanuts. To easily crush granola bars, leave them in the pouches. Gently pound with meat mallet or rolling pin to break them up. You can also crush the cookies with a rolling pin, if you prefer. Just crumble them into a large food-storage plastic bag and roll with a rolling pin. Instead of using cooking spray to spray the foil, try using nonstick foil.